Sciatica, hip, and back pain can all be symptoms of an underlying condition or lifestyle factors. Sciatica describes back pain that spreads to the leg. Often, it presents as a shooting and excruciating pain that makes activities like sitting, standing, and walking impossible. Hip and back pain may present as anything from a dull ache to excruciating pain. The problem with sciatica, hip, and back pain is that it can make everything that you do painful. Fortunately, the proper pair of shoes can fix this. 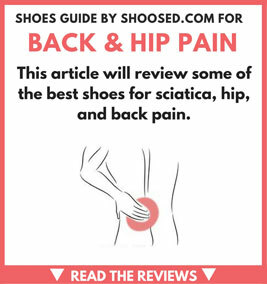 This article will review some of the best shoes for sciatica, hip, and back pain. This pair of shoes is an ideal choice for someone suffering from sciatica because it comes with thick soles that are comfortable to walk on, as well as an air cushion heel that increases impact absorption. Additionally, Merrell Men’s Capra shoes have an excellent grip on the outsole that will prevent slips that can further damage your back. The lacing and upper design allow the shoe to hug your feet securely. The one downside of this shoe is its potential small size. Depending on the width of your feet, you may find that the shoe is too narrow in the toe box or too tight around the ball of your foot. Verdict: As long as you do not have wide feet, this shoe is an incredibly comfortable choice. It significantly reduces the impact that you feel when walking and prevents slips. Unlike some back-friendly shoes, the Metrolyte GEM walking shoes are not excessively heavy or clunky. They consist of a foam footbed that is cushioned with comfortable fabric and provides the arch support that you need when you struggle with back pain. The downside of this shoe is its design as far as width. The laces shown in the picture are a little misleading because the toe is sewn to the shoe and they are slip-on, not adjustable. You may also have difficulty putting inserts in the shoe if you find it is not comfortable enough. Verdict: If you consider your feet to have an average width, these shoes are an excellent choice for walking when you suffer from sciatica. They are also one of the few lightweight shoes you will find that are comfortable and offer arch support. The major appeal of the M1260V5 shoes for hip pain is that they provide excellent midsole support that prevents overpronation and underpronation, both of which can exacerbate hip pain. Additionally, they feature N2 heel cushioning and N2Burst forefoot cushioning that provides maximum comfort as you run and also propels you forward. These shoes also offer a lot of arch support. While arch support is necessary for flat feet (and for someone who suffers from back pain), it may feel very prominent if you have never had a pair of shoes with great arch support. Another factor to consider is the weight of the shoe, as these are a little heavier than similar shoes on the market. Verdict: If you are okay with a heavier shoe, then these are an excellent choice. They offer good arch support and are incredibly comfortable. These well-designed shoes are a great choice for runners with hip and back pain for a number of reasons. First, they have a unique “crashpad” design that features three pods that absorb the shock from walking, regardless of how you land. The shoe is also designed with a foam insole and EVA sock liner and Sauc-Fit, the unique fitting system. Finally, the carbon rubber on the outsole provides great traction to prevent slips and further injury. One of the downsides of this shoe is that it has a narrow toe box, which can cause blisters for someone with wide toes or feet. It is also smaller than the usual Saucony sizing, so if you have worn this brand before the size is misleading. Verdict: This shoe has several unique features including its crashpad design, Sauc-Fit, and EVA and foam inside. While it may not be good for people with wider feet, it is an excellent shoe to prevent hip pain. The Adidas Men’s Bercuda 3 has a break-in period but is otherwise a great shoe. They have thick, rubber soles that help to absorb impact, as well as EVA insoles that add cushioning and mold to feet for increased stability. These shoes have additional comfort because of the ADIPRENE midsoles. Finally, these running shoes offer excellent lateral support, which is critical to alleviating back pain. Aside from the break-in period, these shoes sometimes have a quality design problem where the upper of the shoe occasionally separates from the sole, especially if you are rough on your shoes. Verdict: The quality design problem is a major flaw, but these shoes should not be overlooked as an option if you are not particularly rough on your shoes. They offer tons of comfort, stabilization, and support, all of which are important for back pain sufferers. If you are suffering from back pain or sciatica, these shoes are an excellent choice for several reasons. First, the shoe features DuoMax support that stabilizes your foot while giving you the comfort and support that you need. There is also extra gel cushioning in the forefoot to add to comfort and impact absorption, as well as great arch support. Another awesome feature of this shoe is the personal heel fit, which ensures your foot is snug. Finally, the high-abrasion rubber outsole keeps you from slipping. The one downside of this shoe is that it may not fit wide feet. However, it stretches over time in most cases. Verdict: Unless you have particularly wide feet, these shoes are an excellent choice. They offer support, comfort, and a customized fit. These dress shoes feature a sturdy rubber cap to prevent toe injuries, as well as a thick outsole that provides comfort. Inside, you will find a memory foam footbed and compression molded EVA midsole that adds comfort and stability as it conforms to your foot. Additionally, the outsole grips surfaces to prevent injury. The one downside to this shoe is that there are no heat vents, so they may get hot in some conditions. Verdict: If you do not work in hot or humid conditions, this dress shoe is an excellent choice if you want to look nice at work but still prevent hip and back pain. The flats offer a flexible but supportive sole that is also thick enough to add cushioning and absorb impact. They work well with dresses and skirts and look like a wedge, but are comfortable like a flat. They offer good support for the foot and also come with a removable footbed that allows you to add your custom inserts. The one downside to this shoe is that the footbed support wears down with time. However, they can be expected to last a year or longer with regular use. Verdict: If you don’t mind replacing these shoes after a year or more of comfortable wear, these shoes are an excellent choice. They are also one of the few dress shoes that you will find that are comfortable enough for someone suffering from back pain. The best feature of this shoe is the F-LITE Anatomic sole, which gives you support where your foot and back need it most. It does not have as much thick cushioning as some other shoes, but this means that it has a much lighter weight. Additionally, they are still comfortable. The fit can be compared to a little more than the barefoot feeling without being overbearing. Finally, the shoe has excellent traction and its design prevents uneven tread wear and overstriking in the wrong area of the foot. People with more narrow feet may find that this shoe does not fit, but it is an excellent choice for someone suffering from sciatica who has normal to wide feet. Verdict: As long as you do not have narrow feet, this shoe is minimalistic without being so light that you feel like you don’t have the support. It offers the comfort you need when you suffer from sciatica and/or back pain. This training shoe features a 1” rubber sole with a pivot point that helps drive you forward. The sole is flexible but supportive and the tying system and mesh upper allow the shoe to stabilize your foot. Additionally, the shoe features a REZORB midsole to absorb impact and add comfort and an EVA insole that conforms to your foot. There are a few things to consider before purchasing this shoe. First, the mesh fabric is not as durable as you would hope. Second, the narrow toe box of this shoe may leave your feet in pain if you have a wide feet or foot condition. Finally, some people with sciatica find that this shoe does not offer as much ankle support as they need. Verdict: If you do not have a condition that requires a lot of ankle support or wide feet, then this shoe is a good choice. It absorbs impact well and offers a fair amount of cushioning without being too rigid. The Wave Toe Post sandals by Vionic feature a comfortable EVA footbed that is textured for a better grip. They also have a high, firm arch. You may find that this needs getting used to, but it is necessary to reduce impact when you deal with hip pain. They also have a high, firm arch. You may find that this needs getting used to, but it is necessary to reduce impact when you deal with hip pain. The downside of this shoe is that it is not adjustable. If the shoe does not fit you securely enough, then you may end up with worse pain. This is not a good shoe for people with narrow feet. Verdict: If this shoe fits your foot, then it is an excellent choice. It provides stabilization and comfort when you deal with hip and/or back pain. These sandals wrap around the ankle so that you have a smaller chance of slipping. In addition to offering a secure fit, the straps are adjustable. This shoe also has excellent arch support and a memory foam cushion that grips to your foot. Verdict: Finally, it comes with a Lynco orthotic footbed that provides alignment, balance, and support. Some people find that this shoe is too short in the length, which is the only downside of this sandal. When you suffer from sciatica, hip pain, or back pain, even the most mundane tasks can become a struggle. If you have the right shoes, however, you may find that this pain can be alleviated. Here are the two best shoes for men and women. The F-LITE Anatomical sole is what makes this shoe so unique. It is lightweight and even though it does not offer as much padding as some other shoes, it is just as (if not more) comfortable. These shoes have many advantages for people suffering from back and/or hip pain from sciatica, including an outsole that prevents slippage and construction that offers comfort, stabilization, and support in all the right places.